This customer specifically wanted a 2DIN screen, but did not want to ruin the classic aesthetic of the interior. Solution: the 7” Pioneer AVH-Z7000DAB. It features both Apple CarPlay and Android Auto, Digital Radio (DAB/DAB+), AM/FM, Bluetooth, music streaming, handsfree calling, text messaging and Apple Maps / Google Maps / Waze. You can even utalise Spotify and YouTube. 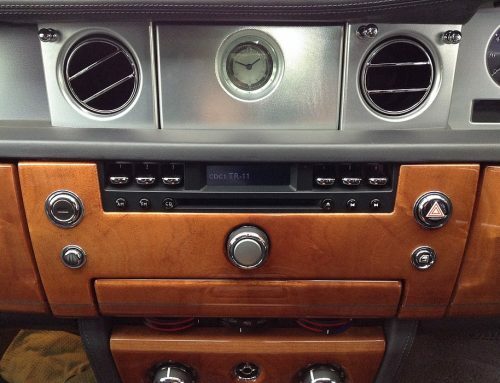 In addition to this, we upgraded the speakers with high quality Hertz component speakers with an amplifier. We added a discrete subwoofer and tuned the system to create an amazing sound in this classic car. Please note that we hid the DAB aerial so there were no additional wires to be seen. This was a clean, unobtrusive installation – perfect for a classic car.